I know it's not a big deal but I'm going to post it, if just one person finds it useful and happens something similar he/she will be able to solve it. Here we have a big roller that is pressed by the hood against a blade spring being stable at both closed and opened positions. The roller was not rolling at all on this operation because the grease was dry or no grease at all. Cleaning and using thick grease solved the problem, now the roller rolls in the opening/closing and no more nasty sounds. 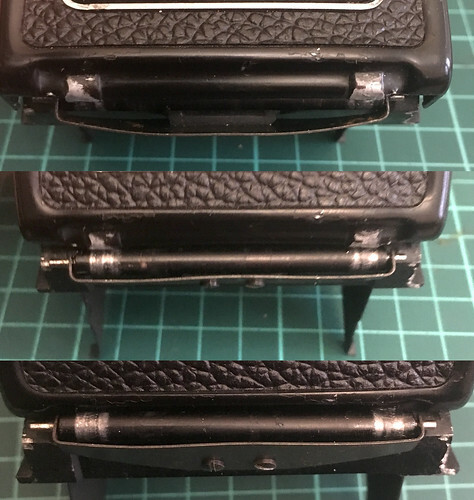 For changing/cleaning the ground glass just remove those small holder-springs and comes out. 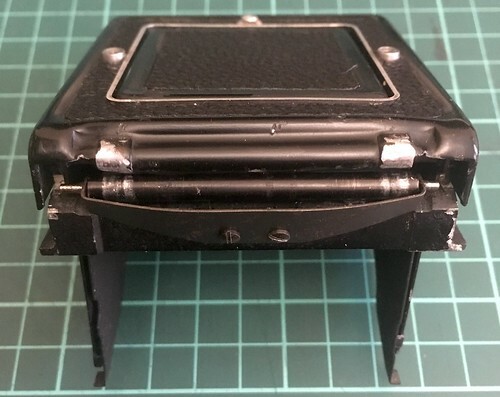 Why the WFL was in such bad shape I think it was at some point when closing the loupe, this one was not well closed, we need to hear 2 clicks, both sides, if only one the loupe plate will pry the top WLF while closing and again we will have the right/left top raised and finally broken. 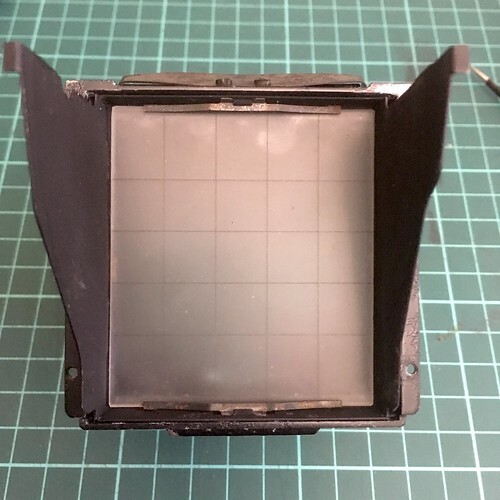 If we press the frontal/top part of the viewfinder until clicks we are now in SportFinder mode, we can focus as well through the mirror reflecting the ground glass and composing through both squares. Oh yes, TLR WLF's do tend to get beat up over the years, and the Rolliecord/flex hood is a bit more complicated. 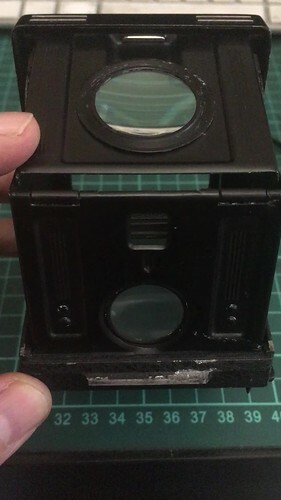 Mine is missing the lens for the magnifier, but I got a replacement some time ago. Just need to sit down and fix it some day. 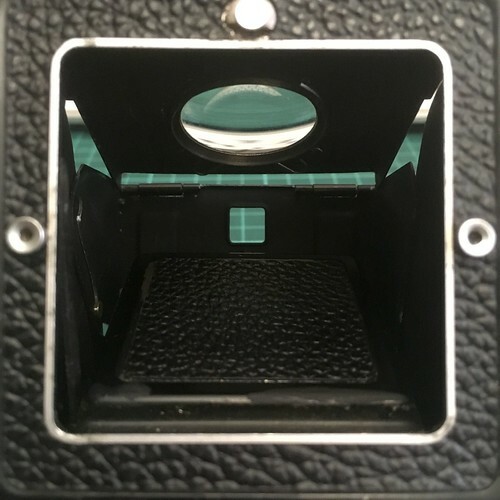 The Rolleiflex viewfinder is a brilliant piece of engineering. 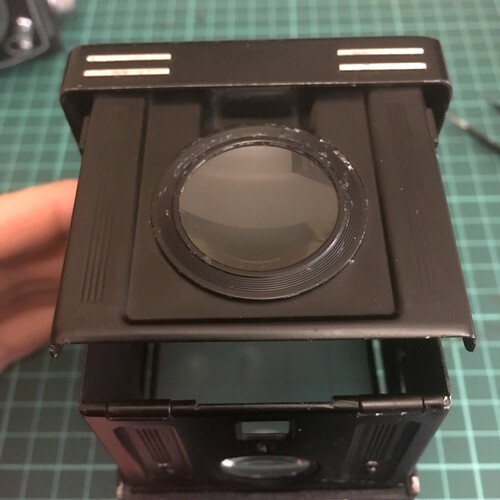 In addition to compensating for parallax, it also has a magnifier for the viewing screen, a so-called sports finder, plus a prism finder, which is put in place by pushing through on the front of the hood. Gordon Ramsay might utter an obscenity in declaring its brilliance, and he would be right.